Natural range Central Ryukyus (Amami and Okinawa Island Group), southern Japan. Habitat Arboreal. Montane as well as urban area. Range in Japan Nichinan City, Miyazaki Pref., Ibusuki City and Yakushima Is., Kagoshima Pref. Date Establish in Miyazaki Pref. was early 1990s or earlier. That in Kagoshima Pref. was in 2003 or earlier. Route Possibly accidental introduction by hitchhiking on ornamental plants. Impact Potentially: Predation and competition with native species. Ota et al. 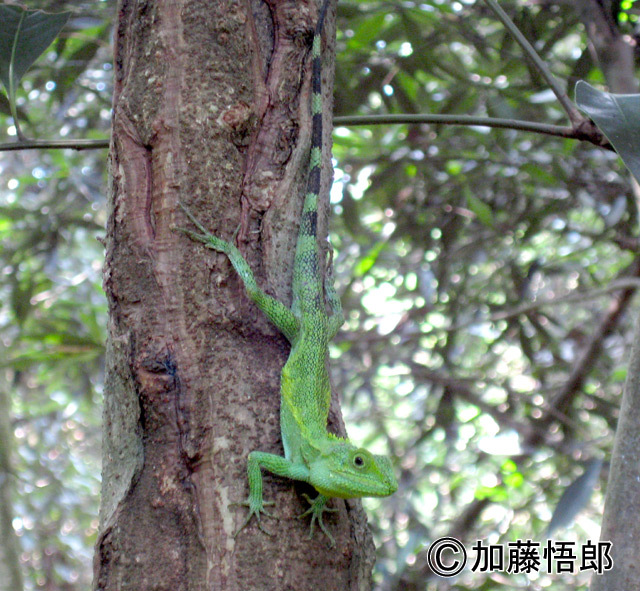 (2006) Colonization by the subtropical lizard, Japalura polygonata polygonata (Squamata: Agamidae), in southeastern Kyushu, Japan. Current Herpetology. 25(1):29-34.